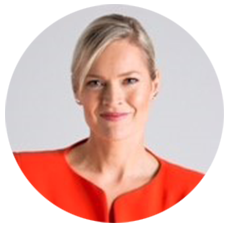 Over the past few months I’ve been privy to the business stories of outstanding Australian women. I’ve cheered them on as they demonstrated how they overcame adversity and given virtual high fives whilst reading their warts and all accounts. 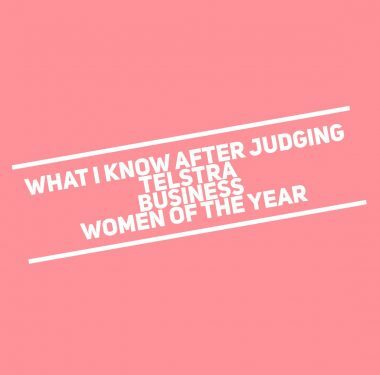 It’s my first time judging the Telstra Business Women’s awards and my admiration for the program has skyrocketed. The judging process is rigorous and carefully designed to ensure every entry receives equal consideration. It has been both inspiring and gruelling. We met with finalists for forty minute face-to-face interviews are were asked to advocate for the person we thought should be the State winner. In the end, Michelle Gallaher, took out the top Victorian prize. 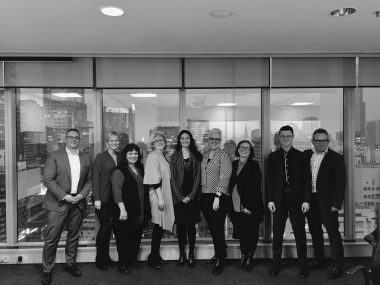 Pic: Victorian judges, 2017 Telstra Victorian Business Woman of the Year. 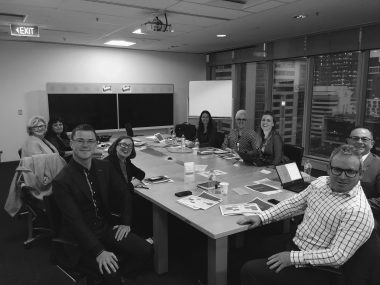 Good to see the gender balance swayed our way! It was refreshing to hear the honesty of many of our applicants. They didn’t try to gloss over the harsh truths that dealing with employees or partners or customers is often very hard, emotionally draining work. We didn’t assess them on these tricky circumstances but were looking for how they navigated themselves out of these stressful situations. Do not be afraid to challenge the accepted way of doing things. The finalist’s backgrounds and roads to success couldn’t have been any different. One quality they did share, however, was an ability to embrace their differences. Each finalist has used a healthy dose of self-belief to rise above adversity and reach their goals. They could demonstrate innovative thinking to push boundaries or forge ahead after a bump in the business road. Of course you have to demonstrate sound financial management and leadership, but business impact is judged on more than the bottom line. Judges have the foresight to understand where your business journey may take you. Be clear on your strategic vision for your business and how you have persuaded others to embrace your values. Show your financial acumen and understanding of key drivers for growth. Show your ability to spot and manage risks. This is particularly important in the face-to-face interview. Judges are looking for a person who could stand on the stage and authentically address guests during awards nights, so let your personality shine through. Craft an effective narrative around your achievements. The judges genuinely want you to enjoy the process and relax. Demonstrate resilience and the ability to bounce back. The judges will often assess you through the lens of emotional and social intelligence. We are looking for real life examples based on your experiences. Be prepared to be interrupted and to be prodded for more information. Expect the judges won’t be holding your gaze the whole time, they will be taking notes. Demonstrate your influence and vision for the future. Back yourself or nominate an amazing woman in one of the many prestigious awards available in Australia. Read our interview with last year’s winner Andrea Mason here. Special mention to Judging Manager Telstra Awards Nele Vandersmissen, her passion was contagious! Want to apply next year? More information here. Posted in Career insights, Elevate your voice.